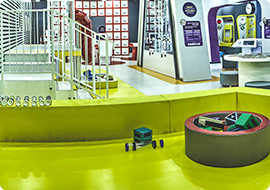 Lunada is an experiential museum, the first of its kind in Israel. Innovative, interactive and fun for the whole family, encouraging activity and learning for all ages at an international level. We would like to invite you, children and adults, to come and share a special, colorful, emotional, educational and innovative experience that will leave you thirsty for more. 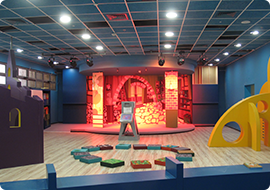 The museum housed in a 4,000 sq.m, 3-story facility that includes eight knowledge spaces with over 50 exhibits and installations in addition to unique outdoor areas. Each area features a different aspect of the world we live in and allows children to experience the various layers of reality and to discover themselves and their place in personal life, family life, public and social lives, as individuals and as part of a group. 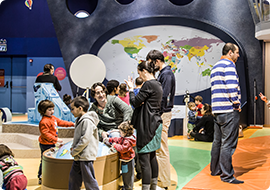 Through play in the museum’s unique areas, children are exposed to significant parts of their own world and practice important aspects of daily life such as time management, money and food, experiencing situations of interpersonal communication, meeting the world of culture and art, the solar system and unique features of planet Earth. * Entrance to the museum is only possible without footwear. Leadership Development – Investing in leaders of nonprofit organizations with the aim of improving their impact on civil society. Management of Nonprofits – Fostering excellence in the management of nonprofit and public sector institutions. Humanities – Restoring the humanities as the foundation of human aspiration and human experience. Jewish Life – Helping successive generations of Jews to discover the beauty of the Jewish cultural and religious heritage and to build and sustain vibrant Jewish communities. Urban Renewal – Supporting urban renewal and community development, as an expression of our commitment to just, inclusive, and democratic societies. For more information, please visit www.mandelfoundation.org.